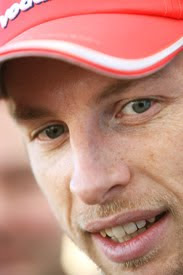 Jenson Button is getting increasingly comfortable in the McLaren, and was fastest in testing at Jerez for a while today. Afterwards AUTOSPORT heard his thoughts on the team's progress and the way the 2010 championship battle is shaping up. Q. How was today's running? Jenson Button: It was good, it's great for every team to get some dry running in. It's been quite frustrating with so much rain and inconsistency with the weather. It started a little bit damp which was quite useful because we got to understand the changeover from the wet to dry tyres. Then for six hours of the day it's been pretty dry so we've got some good running in. The circuit was a bit green this morning but this afternoon it's gripped up and there are no wet patches so it's really good for getting some set-up work done and some long runs. We did a couple of long runs today which are an improvement from last time I was here. So we're moving in the right direction. But there are still a few things that we need to sort out before I'm 100 per cent, but that's always the way in winter testing. The good thing is that we're moving forward with every run we do, we have more of an understanding of the car and we're making improvements. Q. How is the seating position in the car? JB: Yeah, great, I'm really happy. They've done a good job of getting me in the car. It wasn't easy for them to start with, I'm a lot taller than the previous drivers, but it's great now, I'm really comfy and positioned well in the car. I'm very at home in the car and it feels like I've been with this team for a long time. All that is great and it's now just getting our heads down and working on improving the car. I think the Ferrari is a very strong car. If you look at their runs today, they're very consistent. I think they have better consistency than anyone at the moment. It's always interesting to observe what they're up to. I think our pace is good, but there are still areas we need to work on for me to be happy with the car. Q. Did you get a chance to see how some of the other cars are going? JB: I followed a few drivers today, Fernando [Alonso], Michael [Schumacher]. It's always interesting to see what's happening. You never know what fuel loads people are on but you can see what sort of balance they have. The Mercedes to me seemed like it was a little bit twitchy at the rear and braking it looked like it was locking the rears, but if they're on 150kg it's understandable. It's interesting. The Ferrari looked good on the circuit, good consistency. For me, our car over one lap is getting there. We're improving step by step. And on the long runs, we're improving every run we do. There's so much information we've got to day - more than any other test day, for me anyway. We'll go through all of that this evening and hopefully have another good day of testing tomorrow. Q. How close are you to getting the set-up to where it needs to be? JB: I think over one lap it's reasonably easy. For the longer run it's a bit more difficult because you've never experienced running this high fuel. So it takes a little bit longer and trying to get the car consistent from 150kg down to 20kg is the difficult part - and that will be the difficult part in the races. We're working through all the fuel ranges and we'll be doing the same things tomorrow. Q. Is it difficult to not hurt the tyres when the fuel is very heavy? JB: I don't know whether it's the same for everyone, but you can't be 100 per cent every lap with this much fuel on board. You have to look after the car and the tyres, it's something I'm pretty used to so it's not a problem. The aim is to get the car to a point where you don't have to look after the tyres and you can drive at 100 per cent every lap. That's the aim for every team, to try to get the car in a position where you can be 100 per cent every lap and consistent. Q. How do you compare this pre-season to other ones you've had? JB: When you move teams it can be very tricky because when you've been with a team for seven years, change is something that we sometimes struggle with. It's been a lot easier than I expected. I've spent a lot of time at the factory – more time in Woking than I have at any factory before a season. A lot of it is because I spend so much time on the simulator, but it's been really good to get to know everyone. Not just the people I work with at the circuit but the people I work with at the factory. It's a really good atmosphere, everyone is so hungry for success this year. I think last year was a good year, it's a bit of a kick up the arse when you have a difficult season, we've all had them. Everyone is very hungry and that's exactly what I need coming into a team. I feel like I've been here longer than two months. Q. How is the working relationship with Lewis Hamilton so far? JB: We haven't actually been at the same test. I arrived here yesterday at about 5pm, I was here for their debrief of yesterday's running. But I have all the data and it's always interesting to look at a new team-mate's data, and interesting to see how they set a car up. So we're already learning from each other because we have a wealth of experience. For example when I have a test day I'll change something on the car and he'll test that, and vice versa. We trust each other's opinions. Q. Do you feel a rivalry there already? JB: No, nothing at all. We had a good little chat yesterday and there was nothing like that. But then the racing hasn't started yet.